Is Reason still capable of innovation? Reason is still a great first-time buy. Those upgrading may feel short-changed, though, so knock a couple of marks off the score if you've already got v7. Intuitive. Stable. Affordable. Easy to use. Good sound. Browser already seems dated. Little improvement over previous version. 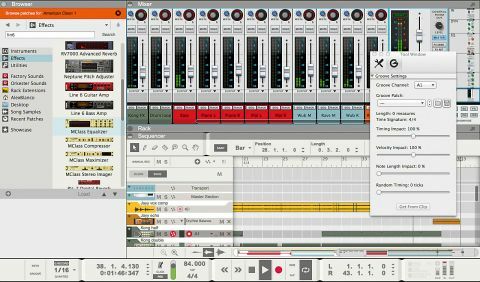 Since its release in December 2000, Reason has gone from self-contained but basic novelty virtual studio to fully functioning DAW, complete with third-party 'plugin' devices in the shape of Rack Extensions. Each full version update - and one point release - has been greeted with justifiable excitement, bringing, as they have, innovative new features and devices, exciting workflow refinements and excellent new takes on existing technologies. "For the first time, Reason users can experience the joy of dragging devices, patches and samples directly"
Even as recently as version 7, Reason saw the transformative addition of such exciting developments as external MIDI instrument integration, audio quantisation, loop-slicing, EQ enhancements and mix bus routing, to say nothing of a slew of new Rack Extensions. And all of this was accomplished by making only the smallest of dents in Reason's legendary stability and extremely low system requirements (though the same can't necessarily be said for third-party REs). Now, it's important to understand this context when we say that Reason 8, coming as it does some 18 months after v7, offers just some small cosmetic changes, a new search function and browser, drag-and-drop import/export of samples, devices and presets, third-party replacements for the soon-to-be-discontinued Line 6 amp emulators, and a couple of minor sequencer workflow tweaks. Hardly a list to weaken the knees. Taking its lead from almost every other DAW on the market, Reason now features a browser panel on its left side. This is the new home for all of Reason's devices, patches and file management functions, and it can, of course, be minimised when you don't need it. A consequence of all this is that the floating Tool Window is now much reduced, offering just global Sequencer and Groove settings. Also built into the browser is a proprietary search function. Need a REX loop? Type 'REX'. A bass patch? Type 'bass'. You can filter your search by selecting Instruments, Effects, Rack Extensions, etc, in the sidebar, and it all makes searching for patches, devices, samples and projects far simpler than before. It is rather lacking in one respect, though: it doesn't offer predictive suggestions as you type, so you have to key in your text and hit the Search button or Enter key before you get any results at all. It feels archaic. Also, some might miss the previous system, whereby searching would open an OS file browser window (we'd have liked the option to retain this), but you do get used to the new method quite quickly. If a browser window seems like a long overdue update, then the next new feature may well strike you as even more of a no-brainer: drag and drop. Yes, for the first time, Reason users can experience the joy of dragging devices, patches and samples directly to where they want them in the Rack or arrangement. Not only that, but you can now drag samples directly onto Kong pads, and REX files into the arrangement, automatically creating a Dr. Octo Rex device. Obviously, this is a very welcome function, particularly for those who already take it for granted in other DAWs. There have been some tweaks made to the sequencer, too. Again, in line with the MIDI editors in most other DAWs, you can now double-click to add or remove notes. Note lengths can also be resized from both ends, while notes and clips can be duplicated via a key command. "Reason 8 is undeniably a great DAW, but that's largely because Reason 7 was so good"
Tracks are now automatically named after loaded patches and mixer channels (as opposed to the last device in the chain), and clips on a track will automatically colour themselves in accordance with the corresponding device colour (changes to either are automatically reflected in the other). It's all useful stuff, but by no means game-changing. Finally, on top of a slightly sharpened overall look, the Transport section has been spruced up. Gone is the angular GUI (itself an evolution of Reason's original brushed metal look), in favour of a more modern, rounded appearance. We take no pleasure in reporting that this is the most uninspired Reason update yet, but if we're honest, we're not all that surprised. When Propellerhead opened its famously closed platform up to third-party developers with v6.5, we suggested that it signalled the end to new bundled Propellerhead devices, and it turns out we were dead right - all we get this time around are some guitar cabinet REs from Softube. That's not to say they're not worthy additions (see Call a cab), but they are, essentially, replacements for the Line 6 emulations, which, though still bundled with this version, will be discontinued by the next major update or thereabouts (October 2016, to be precise). Long-term users will rightly feel short-changed. Reason 8 is undeniably a great DAW, but that's largely because Reason 7 was so good... and indeed, 6 before it. Sure, the new browser and drag-and-drop support are a productive step forward, but they're the sorts of things that should be expected of any DAW in 2014, rather than an excuse to charge existing users €129 for the privilege. All in all, then, Reason absolutely deserves its legions of fans - and version 8 still offers plenty to entice newcomers - but it feels like loyal users are being asked to pay for what really amounts to a point update, not a full new version. Surely, they deserve a little more for a lot less.